You must be a member of the Kuala Lumpur Arts & Culture Group to attend this activity. Would you like to join this group? Explore the historic old tin mining town of Ipoh in the Ipoh Heritage Trail. 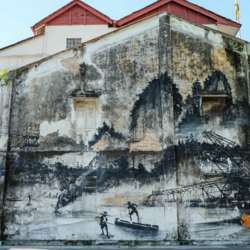 Ipoh is the capital city of Perak, which was developed into a tin mining town during the British era in Protected content . It became a sleepy town after its decline in the Protected content . Today, Ipoh is seeing a revival in interest, thanks its blend of heritage landmarks, modern joints, delicious food and Ipoh white coffee. Comprising 27 recorded points of interest situated from the old town of Ipoh to the maturing business area, the Ipoh Heritage Trail is a show of the city’s history. Stroll and listen to stories about the important landmarks like the Town Hall Building, Ipoh Railway Station, and Birch Memorial. Along the way, you may even want to try Ipoh white coffee or nasi kandar as you are guided through the phases of Ipoh history. If you are interested, please sign up and PM me to confirm by 15 Jan. You need to arrange your own transport to Ipoh. See you there! First come, first served.